Water mites, also known as the Hydracarina, Hydrachnidia or Hydrachnellae, are a group of nine superfamilies and more than 40 families from the prostigmatan Cohort Parasitengona. Although other taxa of parasitengone mites have species with semi-aquatic habits (e.g. the Johnstonianidae), only the Hydracarina are truly subaquatic. There are approximately 5000 named species of water mites (Smith & Cook 1991); however, as water mites of Africa, Asia, and much of South America have been poorly studied, this is likely a great underestimate of their true number. They live in all types of freshwater bodies, from tree holes to hot springs to deep lakes to torrential waterfalls, and some have also invaded oceans (Cook 1974). Members of the Hydracarina are most obviously separated from other taxa in the Cohort Parasitengona by having nymphal and adult stages that live beneath the surface of the water. Morphological characteristics that differentiate the group are less obvious. The combination of larval characters unique to the Hydracarina is that larvae lack the supracoxal seta 'e', the companion seta associated with phi and omega on leg I, and the companion seta associated with the dorsal eupathidium on tarsus I. As well, the palpal genu has two setae compared to the one seta found in larvae of other Parasitengona (Welbourn 1991). Witte (1991) lists a number of unifying postlarval characters, including: presence of glandularia (a combination of seta and gland), reduction of acrosomal filament of the sperm cell, and modifications of the posterior arms of the ejaculatory complex (the complex group of internal sclerites used by the male to form the spermatophore). However, as Harvey (1998) points out, it isn't clear whether Witte intended the Stygothrombidioidea to be included in the Hydracarina. Water mites, like other parasitengones, have an extremely complex life cycle (Smith & Cook 1991). Eggs are laid under water either on the surface of substrates such as stones or vegetation, or inside living plant tissue (Hydrachnidae: Hydrachna) or in the tissues of freshwater sponges and mussels (Unionicolidae: Unionicola; Pionidae: Najadicola). In the less derived groups, the larvae swim or crawl to the water's surface after hatching, and break through the surface film. They then run about on the upper surface of the water or on emergent aquatic plants, seeking insect hosts to parasitize. In more derived taxa, the larvae remain under water where they search for pre-imaginal larvae (e.g. of odonates) or pupae (e.g. of dipterans). Larvae of the 'aerial' group typically begin to parasitize a host immediately upon encounter; in contrast, 'aquatic' larvae merely attend the pre-adult host, and only begin parasitism after the adult has emerged from the last larval or pupal skin. Larvae engorge on host haemolymph and dissolved tissues for a period lasting from a few days to several months, depending on the taxon. Engorged larvae drop from the host back into the water. Because hosts of water mite larvae are almost invariably winged adult insects (exceptions are in the Hemiptera, where nymphal hosts may be parasitized), mites are often carried far from their natal water bodies. Thus parasitism serves not only a nutritional function for hydracarines, but it is the major means of dispersal and colonization of new habitats. Although parasitism is clearly a very important feature of water mite life cycles, the parasitic phase has been lost repeatedly in different lineages of mites (Smith 1998). Non-parasitic species appear to be evolutionary 'dead ends', as there are no clades of non-parasitic taxa, merely isolated species in genera of otherwise parasitic species. Once back in the water, the engorged larva transforms into a calyptostatic protonymph (also called a nymphochrysalis) that is a pupa-like stage inside the integument of the larva. Within the protonymphal cuticle, the next stage - the deutonymph - develops. The deutonymph ecloses as an active swimming or crawling predator of all stages of aquatic insects, crustaceans, and other mites (Proctor & Pritchard 1989). Deutonymphs are usually less highly sclerotized than adults, which allows their integument to expand as they feed. A well-fattened deutonymph transforms into a calpytostatic tritonymph (also called a teleiochrysalis). The adult that emerges is also predatory and typically feeds on prey similar to that chosen by the deutonymph. Adults are more highly sclerotized than deutonymphs, and have functional genital openings. They are also often extremely sexually dimorphic, particularly those taxa in which the males transfer sperm directly to the female. Copulation has apparently evolved repeatedly within the water mites from an ancestral state in which sperm was transferred via spermatophores deposited on a substrate (Proctor 1991). The full range of sperm-transfer modes (copulation, paired but indirect, completely dissociated) occurs within the water mites, making their mating behaviour among the most diverse of any group of arthropods (Proctor 1992). One of the most striking things about water mites is their often brilliant colouration. Scarlet, orange, red and yellow mites are common, and are extremely visible against a background of green water plants. These bright mites are often very unpalatable to fish (Kerfoot 1982), presumably due to noxious secretions from their skin glands. Although one might expect this aposematic connection between redness and distastefulness to have evolved as an anti-fish-predation mechanism, both the bright colour and foul taste are also present in terrestrial parasitengones (Garga 1996). Based on current distributions of major taxa, water mites appear to have had a Pangaean origin, or to have evolved prior to the continental consolidation that resulted in Pangaea. The group was originally considered to be a polyphyletic assemblage of taxa that had independently invaded water (discussed in Cook 1974). However, a number of setal characters of the larvae and genital/spermatozoal characters of the adults appear to unite these superfamilies as a monophyletic group (Welbourn 1991, Witte 1991, Harvey 1998). There is general agreement that the Stygothrombioidea, Hydrovolzioidea, and families in the Hydryphantoidea are at the primitive end of the cladogram; however, the hydryphantoid families have no clear synapophorphies and the superfamily may be paraphyletic (Smith & Cook 1991). There is also general acceptance of the Hygrobatoidea as being among the most derived of the superfamilies. Relative positions of the other groups are not so clear. Phylogenetic studies of the water mites are hindered by the ancient origin of the group (thus removing biogeography as a tool at the superfamilial level), rarity of fossils, and the apparent high degree of convergence in adult morphology. Larval morphology appears to be more conservative, and has been extremely valuable in understanding relationships among other members of the Parasitengona (e.g. Welbourn 1991). To date, no DNA-based phylogeny has been published, although several are in progress. Cook, D.R. 1974. Water mite genera and subgenera. Mem. Amer. Entomol. Inst. 21: 1-860. Garga, N. 1996. 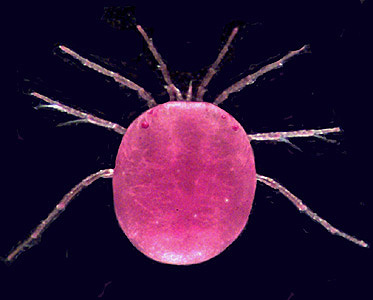 Aposematism in water mites (Acari: Hydracarina): an antipretador defense mechanism, a phylogenetic hold-over and protection fromdamaging light. M.Sc. thesis, Queen's University, Kingston. Harvey, M.S. (1998). The Australian water mites: a guide to the families and genera. CSIRO Publishing: Melbourne. Kerfoot, W.C. 1982. A question of taste: crypsis and warning coloration in freshwater zooplankton communities. Ecology 63: 538-554. Proctor, H.C. 1992. Mating and spermatophore morphology of water mites(Acari: Parasitengona). Zoological Journal of the Linnean Society 106:341-384. Proctor, H. and G. Pritchard. 1989. Neglected predators: water mites (Acari: Parasitengona: Hydrachnellae) in freshwater communities. J. N.Amer. Benthol. Soc. 8: 100-111. Smith, B.P. 1998. Loss of larval parasitism in parasitengonine mites. Exp. appl. Acarol. 22: 187-199. Smith, I.M. and D.R. Cook. 1991. Water mites. pp. 523-592 in: J.H. Thorp and A.P. Covich (eds.) Ecology and classification of North American freshwater invertebrates. Academic Press, San Diego. Welbourn, W.C. 1991. Phylogenetic studies of the terrestrial Parasitengona. pp. 163-170 in: F. Dusbabek and V. Bukva (eds.) Modern acarology, Vol. 2. Academia, Prague, and SPB Academic Publishing, The Hague. Witte, H. 1991. Indirect sperm transfer in prostigmatid mites from a phylogenetic viewpoint. pp. 137-176 in: R. Schuster and P.W. Murphy (eds.) The Acari: reproduction, development and life-history strategies. Chapman & Hall, London. Page: Tree of Life Hydracarina. Water mites. Authored by Heather Proctor and Mark Harvey. The TEXT of this page is licensed under the Creative Commons Attribution License - Version 3.0. Note that images and other media featured on this page are each governed by their own license, and they may or may not be available for reuse. Click on an image or a media link to access the media data window, which provides the relevant licensing information. For the general terms and conditions of ToL material reuse and redistribution, please see the Tree of Life Copyright Policies.